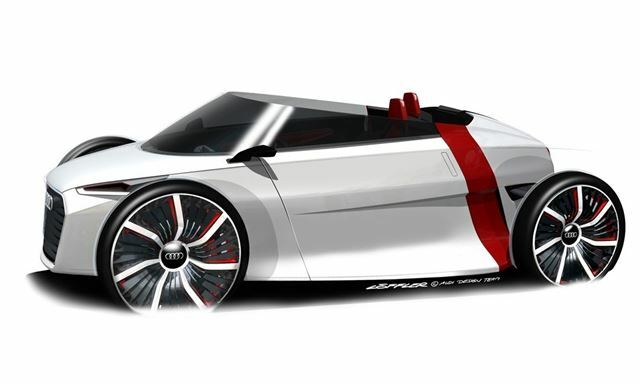 Audi will unveil an open-top version of its urban concept car at the Frankfurt motor show in September. The Spyder variant joins the recently announced Sportback concept model and is based on the same lightweight design with a carbon fibre reinforced polymer cockpit. The Spyder urban concept is powered by two e-tron electric motors giving the ultra-light concept cars rapid acceleration while a lithium-ion battery supplies the energy. It's fitted with 21-inch alloy wheels and on the outside has protective surrounding plates incorporating strips of ‘blinking’ LED lights. The Spyder version has a low, continuous window area and doors that open upwards diagonally. Inside there is sporty, low-slung seating for two mounted in a slightly staggered position. All the controls and materials are designed to be lightweight plus the driver can adjust the steering wheel and pedals for their own driving position.